What is that sound I can hear in the background ... Like a quiet, lonely sobbing ... I think it's coming from your garage. It's alright Miss Scarlet, the weather will be perfect before you know it and you and Dar will head out for adventures! Brenda - She has been shedding tears - little oil droplets. Poor thing. I need to go out and have a chat with the poor miserable wee shadow. 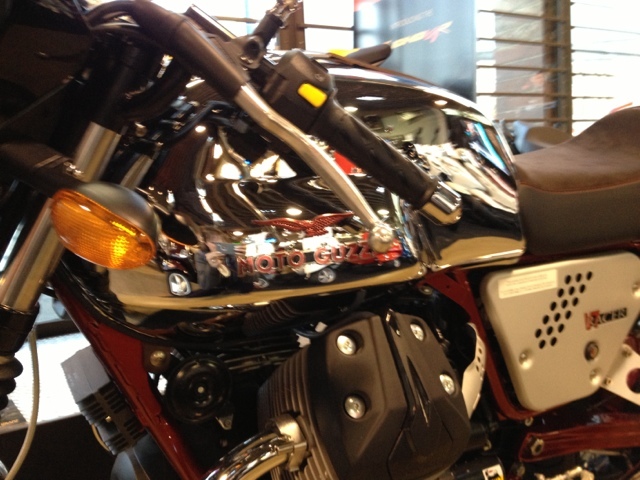 Hey have you looked at the new Honda CB1100 - OH MY GOSH it is gorgeous, I am in serious want, but my hubby keeps saying "No". A girl can never have too many bikes if you ask me. 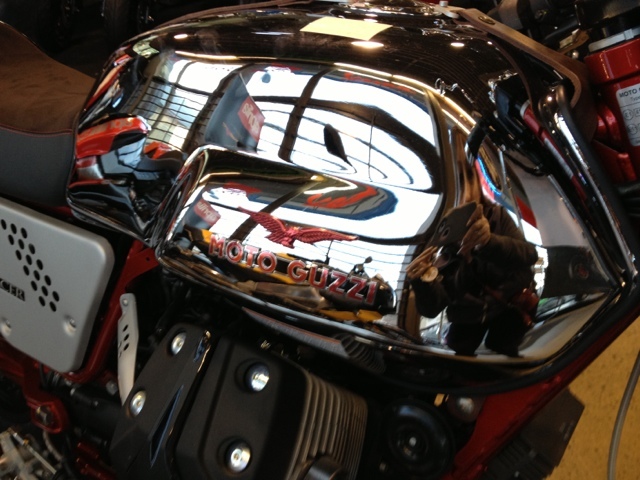 That Moto Guzzi number looks numbered up and ready to race - love your reflection in the chrome. Cheer up, the end of Feb. is just two weeks away - lucky you staring spring in the face, here, we are still staring at snowbanks. Drool and sigh, oh my! Karen - I know I'm lucky because most of Canada is still feeling winter's wrath. I ddpay my winter dues for 17 years up in Prince George. I think I just want some sunshine. 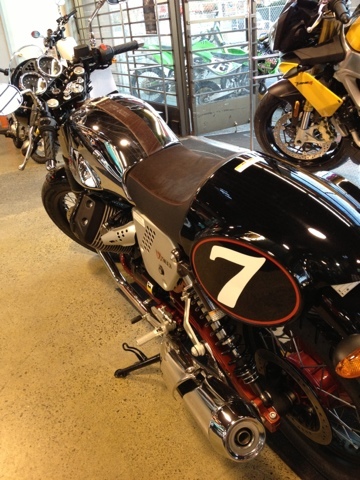 That Moto Guzzi s pretty sweet, but not very practical for my needs, but dreaming is fun. cheer up but don't abandon your first love, Scarlet. Spring is just around the corner. When Spring has sprung Scarlet will be ridden again. I can completely relate to the ho hums and mehs. I haven't been out on the bike recently. Brad needed it for a Team Oregon video shoot last Saturday so I had to cage it to coffee and the weather has been quite sporadic. Nice and sunny to get you motivated first thing in the morning, but by the time it warms up it has clouded over and started to sprinkles, which then instills the meh. With spring will come rain, but at least it will be warmer. 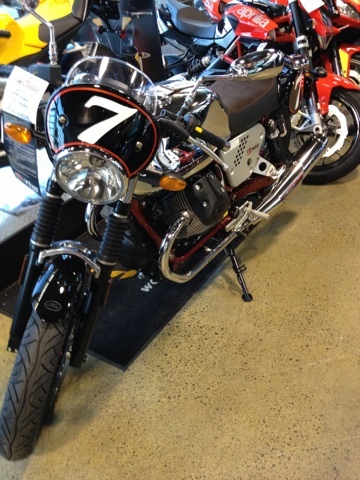 Oh and nice Guzzi. too. I thought they did something spot on with that one. 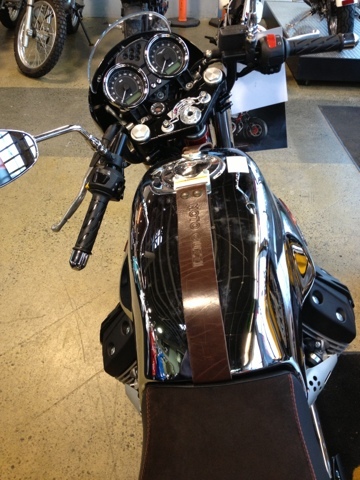 Seriously like the looks of that CB1100 .. ta for pointing out the new addition to my wish list! "PMS" is a good one! What is mine? Parked Scooter Syndrome? PSS.. Anyway, I got it BAD. Even when the sun breaks out in the 40s it is darn cold riding unless one is acclimated to it. I will go over today and crank her up and let her run for about 10 minutes. I'll oggle, feel frustrated, and dream of back roads, as I always do. Spring is coming...can't be too soon! I think we have all been suffering through various stages of PMS or PSS . I won't complain too much because I don't have the snow or really cold temperatures to deal with. But now that Scarlet is quietly napping in the garage I am feeling the low vibe more and missing the road. I still haven't figured out when she will be back on the road, but think it will be sooner rather than later. I am kind of digging the tin can commute (bus) in the morning because of the air fluff factor & it's a mindless 20 minutes. In fact I think there will be a bus pass in my future next winter for a few months just a little easier on the arthritic joints. Hope you all get over your PMS or PSS soon!